This luxury two bedroom second floor apartment is situated at Laguna Beach, a beautifully landscaped complex with excellent facilities. 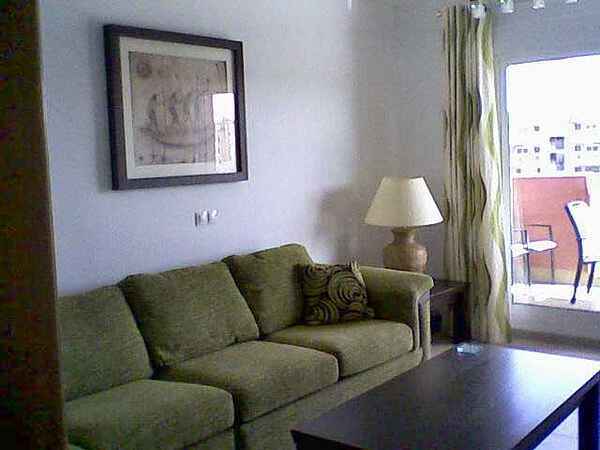 The apartment consists of a spacious lounge with wrap around sofa (includes double bed) and side table, coffee table and TV unit with DVD and CD player and TV with satellite free to view channels. Patio doors lead from the lounge onto a private glass fronted terrace with views over the main swimming pool complex, the lake and to the sea. The terrace has patio furniture for al fresco dining or to just sit with a glass of wine and relax. There is a double bedroom with en suite shower room and a twin bedroom, this comfortably sleeps four adults. The main bathroom consists of bath with shower, toilet, vanity unit and bidet. There is also a fully fitted kitchen with everything you need for your stay. The apartment is fully air conditioned, with heating for the cooler months and includes everything you will need for your stay.. If you are looking for a relaxing holiday with family or friends, then this is the ideal place. The apartment is non-smoking but you may smoke on the terrace if you wish. Welcome packs are available on request. Laguna Beach is a beautifully landscaped complex built next to a natural salt water lake with sailing and canoeing and has excellent services and facilities. For the smaller children there are two outdoor playgrounds with safety flooring. There is an outdoor bar offering drinks and excellent tapas, it is open in the summer from breakfast to the early hours and is ideal for having light refreshments or meeting with friends. During the summer there are often organised activities and organised games for the children. The apartments all have their own designated underground parking with lifts to all floors, offering a high level of security whilst of course keeping your vehicle cool during the hot weather. The complex is fully fenced and gated with a security patrol. There are ramps for all entrance doors and raised areas on the complex, making it ideal for disabled guests (please confirm before booking). Wifi is available on site. The beach is situated approximately 200 metres away and has a beautiful palm tree lined promenade which stretches all the way to the harbour, there are bars and chiringuitos dotted along the way to offer cool refreshments. Whilst a leisurely stroll will take around 45 to 50 minutes, it takes about 5 to 10 minutes to drive into the centre of Almerimar, giving you the convenience of being close to the centre but giving peace and quiet in this picturesque location. A bus service is available from Laguna Beach to Almerimar. On a clear day, in the winter months, the snow capped mountains of the Sierra Nevada which hosts the popular and most southerly European ski resort can be seen in the distance. For more details of the complex and area, please contact us. Den här bostaden kan inte bokas direkt. Om du vill boka den, kan du kontakta ägaren genom att skicka en förfrågan. Glass fronted terrace offering views of the pool complex, lake and sea, with patio furniture for al fresco dining.